Lieutenant Colonel Asbjørn Lysgård, Norwegian Army. Introduction: Military leaders of all branches and departments confront foreign policy on behalf of their governments, developing capacities and resilience to win the current fight against an adversary that in many cases is unknown or has a complex leadership structure. Knowing who to trust and who is willing to support a nation’s efforts becomes important as leaders build a “coalition of the willing.” Through the Global SOF Network (GSN), special operations forces (SOF) can execute integrated campaigning with partners to facilitate dialogue across borders, shortening lines of communication and continuing development of high technology solutions. As information is transmitted across the world in seconds, timely planning and coordination in support of an operation becomes more important than ever, in order to protect soldiers and win the current fight. It has become apparent that the growing complexity of each mission demands an ever-increasing ability for situational awareness. The creation and implementation of the GSN by partner nations has created cost effective coordination solutions and by that, increased security for deployed personnel across the globe. Moreover, enhanced understanding by political leaders and senior military officials on how to exploit the vast opportunities the GSN provides in support of creating a coalition has yielded progress in the fight against Daesh. During the German invasion of Norway in 1940, Norwegian Defense Forces lacked everything from timely plans and defense preparations to strategic guidance on how to fight a war. Diplomatic ties, on the other hand, specifically between Norway, the United Kingdom, and the United States, were steadfast and were soon to prove their importance. Throughout the German occupation of Norway, close ties between Norway and her allies developed, allowing the Royal Norwegian family to settle both in London and Washington. King Haakon VII of Norway fled to London, as did the Norwegian government, thereby escaping the German invasion. Their freedom and survival became immensely important as did the need for unconventional and SOF. In 1940 an organization named the Special Operations Executive (SOE) was established in Great Britain with the support of Sir Winston Churchill and approval by the British Cabinet; through this organization the first Norwegian SOF unit was created, the Norwegian Independent Company No. 1 (NOR.I.C.1, later known as Company Linge). Concurrently, the United States was setting up the Office of Strategic Services (OSS) under the leadership of William J. Donovan, an effort that benefitted from the support of British Special Intelligence Services (SIS) and the SOE. These establishments of small units with reach-back capabilities to Whitehall and Washington are known to be the first official cooperation between SOF units, creating a network for agents across the globe. In 1945 the OSS sent Major William Colby, who would later become the first director of the Central Intelligence Agency, to lead the Norwegian Special Operations (NORSO) Group in Norway and to conduct sabotage and collaborate with organized Norwegian resistance and guerillas. For a small nation like Norway, the connections and personal relations that were established with colleagues from the U.S. and United Kingdom during the Second World War set the foundation for the future development of SOF. Norway, however, following the Second World War, disbanded all its SOF units to prioritize a larger conventional force structure to meet the Soviet threat. The legacy of OSS and SOE was still present though, especially in the reserves and the Norwegian Home Guard. Finally, almost a decade after the war, Norwegian Defense Forces started to reinvest in SOF. In 1953, the Navy established the first teams of Frogmen and, in 1962, the Army established Hærens Fallskjermjegerskole (HFJS), the Army’s Commando School, to train long-range reconnaissance units for parachute insertion behind enemy lines. During the Cold War, U.S. SOF worked closely with HFJS to shape the battlefield, fighting off a potential threat from the East. Throughout the Balkan wars and the Kosovo crises, Norwegian SOF became an expeditionary strategic deployable force, which later developed into Hærens Jegerskole/Forsvarets Spesialkommando, the predecessor of the current strategic command. The Norwegian Special Operations Command (NORSOCOM) was established on January 1, 2014, when its first commander, Rear Admiral Nils Johan Holte, took command of the two tactical Norwegian SOF units, Forsvarets Spesial Kommando (FSK), and the Navy SOF unit Marinejegerkommandoen (MJK). Since that time, the NORSOCOM commander and his staff have strengthened the long-established relations between the different SOF units around the world. Within NORSOCOM there are departments specifically tasked with handling international relations and interagency coordination and connecting the lines between various organizations and government entities. NORSOCOM is represented within the Norwegian National Command Authority, NATO command, and at U.S. Special Operations Command (USSOCOM commonly referred to as SOCOM) by a wide range of liaison officers (LNOs). This forward presence is a part of the global SOF community, representing the NORSOCOM commander in many SOF venues, organizations, and arenas. Many LNOs report directly to the Commander NORSOCOM or the Chief of Defense as needed or required. The long-term relationships created during the interactions of agents and commandos during the Second World War never ceased to grow and develop. The networks continued to expand, culminating in the current fights in Afghanistan and Iraq, where this multi-faceted network of professionals has proven its value to military, civilian, and political leaders. The trust that has been built within the group of individuals that belong to the SOF community is immeasurably strong. However, new technology and the methods of modern, sophisticated warfare have made it clear that to win the current fight, SOF operations require non-SOF support. The importance of a broad coalition and mutual support has become more evident as international matters create important concerns for politicians. A global SOF network can accelerate development; create strategic options for policymakers and provide the best military, and sometimes grass-roots political advice, in a timely manner to strategic leaders. SOF depends on continuous development to remain relevant, and one way to develop its relevance is through close interactions with other nations’ SOF. Thus, SOF networks aid in both tactical development and fostering strategic partnerships. A SOF network among friends and allies across the globe serves many interests. It is in the interest of small states, as well as in the interest of regional security partners, to develop the Global SOF Network. In this context, networks of the GSN include an understanding of SOF like-organizations, operational support requirements, communication technology, techniques, and procedures. When Admiral William H. McRaven assumed command of USSOCOM on August 8, 2011, he envisioned and initiated a formalization of the GSN. The idea was to establish a peacetime network of SOF throughout the globe to build on the experience gained from over a decade of war. Through a global SOF network, SOCOM would enable SOF allies around the world to establish and sustain partnerships, very similar to how NATO Special Operations Headquarters has organized SOF cooperation in Europe. To further take advantage of these regional and global networks, small nations need a dedicated, strategic SOF element with the authority and resources to operationalize initiatives. The future of the GSN should therefore focus on the ability of individual states to establish strategic leadership of their SOF, best addressed through a dedicated SOF element, especially for small states. Smaller states with correspondingly smaller military staffs can only afford a single “node” or organizational entity to coordinate across all of the military elements. A central organization creates a single, strategic SOF Enterprise with both efficiency (effective use of resources) and effectiveness (being able to quickly synthesize and coordinate from a central point). Tactical units, however, must be empowered to practice “mission command” or make decisions based upon intent when they are confronted with changes in their environment. This suggests centralizing at the strategic level and decentralizing—at least from a decision-making standpoint—at the tactical level provides a “best practices” solution. In effect, this describes the U.S. mission-command philosophy in action. This is a subtle but extremely important point that must not be lost. This also requires the commander to be comfortable with risk and puts a priority on selecting excellent operators that are not only tactically superior but also have a strategic mindset. The strategy of the NORSOCOM commander is investing in the development of junior and mid-level officers in order to expect better decisions in the field based upon his intent, thereby “buying down this risk” in advance through education, training, and development. This investment in junior officers’ strategic abilities aligns with Admiral McRaven’s 2011 initiation of rigorous process assessment for how to best position and sustain U.S. SOF to meet current and future challenges to U.S. national security. Guiding the assessments was an assumption that “there are no local problems;” solutions must therefore come through cooperation, collaboration, and building capacity with partner nations (PNs). 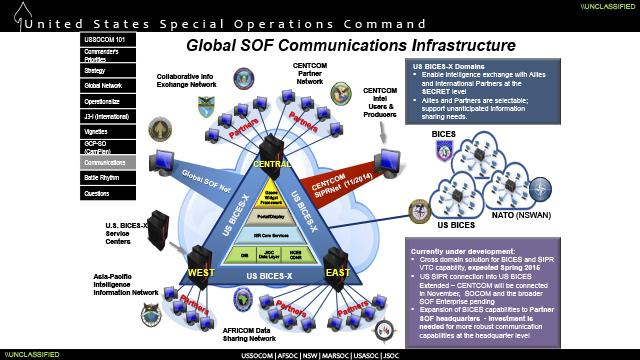 McRaven referred to the product of that assessment as the “Global SOF Network strategy.” The future of SOF in accordance with Presidential direction and as envisioned in the GSN initiative, lies in joint operations, with U.S. SOF operating by, with, and through its interagency and international partners as the Global SOF Network. In 2006, Admiral McRaven was tapped to lead Special Operations Command Europe (SOCEUR), based in Stuttgart, Germany. Under his initiative as Commander SOCEUR, he established the NATO SOF Coordination Center (NSCC), enhancing and integrating the efforts of all NATO SOF. In 2010, the NSCC evolved to become the NATO SOF Headquarters (NSHQ) in 2010. To support this NATO initiative, small states like Norway contributed personnel to the Headquarters from the very start. NSHQ was viewed as a mechanism to enhance SOF cooperation and coordination and to give small states a common arena to address strategic SOF-specific issues within the NATO alliance. Today NSHQ is collocated with Supreme Headquarters Allied Powers Europe (SHAPE) and, among several other roles, has become the center for coordination among NATO allies in the development of SOF. When Admiral McRaven took over as Commander of SOCOM, he drew on the success of NSHQ, along with his service as the eleventh commander of Joint Special Operations Command. Admiral McRaven also spent much time in Afghanistan, where operations intensified on his watch. His experiences relying on cooperation with interagency and coalition forces made it clear that a network similar to that formalized in NSHQ needed to be built between SOCOM and its international SOF partners to ease the future planning and coordination of U.S. operations with coalition support. A series of strategic meetings between McRaven and other countries’ SOF commanders and Chiefs of Defense resulted in the planning and formation of national strategic SOF commands like NORSOCOM in Norway. A SOCOM-like structure is necessary to take full advantage of the opportunities NSHQ and SOCOM provide in terms of regional SOF cooperation. Interoperability; common command and control structures; and operational-level, deployable, joint, and combined SOF headquarters are all examples of the issues that were considered in establishing the GSN. Knowing how to address lessons learned and integrating knowledge from previous operations are ideas that must be addressed through strategic commands. Coordinating unity of interest and community of action is a pillar of the GSN and a vast improvement on the complexity of fighting information sharing, intelligence, and foreign disclosure issues. In spite of this, location, space, limitation of access, and distribution of classified documents turned out to be a long and painful process in the development of the GSN. It was not until May 2014, when the transition of the global SOF operational planning team (OPT) led by U.S. Army Colonel Stuart Bradin stood up the J3-International at SOCOM, that the global SOF network truly began to operationalize. It was during this time that the U.S., along with all of its equivalent international partners in the J-3, came together to work directly alongside one another in a horizontal, agile, and cooperative organization inside the SOCOM headquarters. The new location provided an open workspace where PNs could communicate with national commands through both national and NATO communication systems. The flexible, open workspace community allowed information to flow quickly and easily, as opposed to the episodic and fractured manner consistent with assigning separate rooms or workspaces to each nation. Additional rooms were provided with the new arrangement to facilitate one-on-one discussion when needed, and large areas could be cleared for briefings of different classifications, pending attendance and content of the PN discussions. J3-I was tasked to integrate PNs within the GSN. Its goals and primary functions were to facilitate enhanced decision making for U.S. and global SOF commanders, integrate PNs into SOCOM processes, increase inter-operability, improve staff processes to better inform strategic planning and resourcing, and enhance and accelerate the development of multilateral courses of action and cooperation among global SOF partners. As Admiral McRaven prepared to transition command to his successor, the fifth International Special Operations Forces (ISOF) Conference took place in Tampa, Florida. The theme of the conference was “Strengthening the Global SOF Network,” and SOF representatives and commanders from more than eighty countries participated. The conference brought forth a new issue not explored in depth in previous conferences: SOCOM’s network strategy, which emphasized a comprehensive whole-of-government approach to coordinate agencies, departments, and PN SOF integration into SOCOM, did not fully explain how small PNs were expected to contribute to and benefit from the GSN. It takes networks to fight networks. Governments that want to defend against Netwar may have to adopt organizational designs and strategies like those of their adversaries. This does not mean mirroring the adversary, but rather learning to draw on the same design principles that he has already learned about the rise of network forms in the information age. These principles depend to some extent on technological innovation, but mainly on a willingness to innovate organizationally and doctrinally, perhaps especially by building new mechanisms for interagency and multijurisdictional cooperation. The list does not represent all the sub-networks of the GSN. However, these sub-networks are the most prominent at the inter-organizational level. One of the most difficult challenges so far has been the information assurance coordination between the different agencies and military representatives from the PNs. Each country has a national agenda and legislative systems to follow and, on several occasions, there have been challenges as to how to implement and share information both to and from certain PNs due to legal restrictions in information management. To meet the level of information sharing needed within GSN, the classified information sharing system BICES-X was leveraged. It was developed from the NATO Battlefield Information Collection and Exploitation System (BICES). This system offers potential solutions to information sharing; however, limitations in the distribution of the system exist, as it is a chain of command (top-down) distributed system. Regardless, the system and the network proved their value in July 2014, as will be discussed in the next section, when the first phases of what were to become Operation Inherent Resolve (OIR) kicked off. Figure 1 depicts the lines of communication in the system and clearly underlines the importance and functions of the GSN. In addition, the BICES system provides the ability to establish live video teleconferences (VTCs) between national headquarters and forward operating bases, as well as joint and NATO headquarters. This unique capability provides members of and commanders within the GSN to have live-feed, secure conversations in support of ongoing missions. On a regular basis, all LNOs need to communicate with national headquarters to get additional guidance. SOCOM has on this matter provided facilities for national reach-back, where every nation can install secure national communications systems. This opportunity reinforces and supplements the reach-back capabilities provided by the different nations in the “Coalition Village” at United States Central Command (CENTCOM). Based on the creation of the J3-I and the Global Mission Support Center (GMSC) at SOCOM, it appears that SOCOM has adopted a form of Network Administrative Organization for the overall network. SOCOM facilitates and synchronizes the day-to-day management of Global Mission Support, through a focus on strategic/global involvement. The GMSC provides daily and weekly coordination, with the opportunity for deep-dive orientations for the Commander SOCOM on a regular basis, all with PN presence. The process is managed and supported by the J3-I through the Campaign Synchronization Process. Based on strategic inputs, a three-year operation cycle is developed. Complicating the process are the different timelines each PN sub-network operates under, the challenge of coordination with each national headquarters, and conflicting governmental guidance. We are living in a hyper-connected world; the spread of technology into an increasing number of cultures and societies is driving change in the strategic environment. The Cold War suppressed political mobilization in a variety of ways. The removal of those constraints, coupled with technology, is creating both challenges and opportunities. Adversaries can now easily access tools that range from advanced weapons systems and cyber capabilities … By increasing transparency, communication, and collaboration with our partners, we maximize the effectiveness of our collective action against shared problem sets. SOCOM will continue to invest in these relationships so that our network development outpaces that of threat networks. This statement, given on March 18, 2015, wrapped up the ongoing process and described the coalition now operating in OIR. Technology and the GSN paved the way for continued PN representation and integration at SOCOM. Lead planners and coordinating events were covered by PN LOs/staff officers within J3-I. By using the existing representation at SOCOM, the leadership set an example on how integration should be done. Initial phases of OIR were Special Operations Command Central (SOCCENT) led; however, CENTCOM was soon to become the lead in what developed into a long-term fight against terrorist organizations in the Middle East. The future of OIR will depend on the new strategic guidance given by the next commander of CENTCOM, General Votel, currently serving as Commander SOCOM. His experience with SOF and knowledge of fighting a network will definitely be added value in fighting Daesh. A nation’s specific purposes for participating in a specific operation or a mission can affect its commitment. It is therefore important to establish informal communities of interest and formal communities of action. In the GSN, these take the form of working groups facilitated by J3-I and could develop and foster PN contributions to mission-specific tasks. In the early stages of any operation, and in OIR specifically, knowledge and reports of updated information to respective headquarters are essential; it is necessary to provide actionable information to national stakeholders and political policy politicians. A challenge in fulfilling this requirement, as previously mentioned, is interagency (IA) cooperation. Intel-related information sharing has proven to be a slow process in SOCOM, where only the U.S. has the capability to distribute information bilaterally or within closed communities such as the Five Eyes Alliance (FVEY.) The FVEY environment, best described by the fugitive former NSA contractor Edward Snowden as a “supra-national intelligence organization that doesn’t answer to the laws of its own countries,” lives its own life. For other PNs information has, in many cases, been over-classified, and Foreign Disclosure Officers (FDO), or the lack of sufficient FDOs, have severely slowed down the release process. There is an educational gap in classification guidance at the operational level, leaving staff not fully trained in the use of appropriate classification. The Middle East Stabilization Force (MESF) tetragraph was created to ensure inclusion of all PNs involved in OIR; however, the tetragraph wasnot always effectively used due to lackwill or skill.. SOCCENT representatives commented on several occasions throughout the coalition building process that information sharing does not begin until the commander; the J3; and authors of plans, orders, and briefing products embrace the information-sharing mindset and begin classifying documents and products for release within the MESF and other offices. For PN LNOs in support of OIR, it has become hard to incorporate lessons learned about Daesh’s tactics, techniques, and procedures when classification issues prevent them from being shared. U.S. Army Major General Michael K. Nagata, Commander SOCCENT, expressed his guidelines on information sharing to the entire Combined Joint Special Operation InteragencyTask Force (CJIATF) during a VTC: “If you have included everyone on your email, CC in some more.” Until this issue of information sharing is resolved it will be difficult to operate as a coalition. A recurring issue identified by both U.S. and PN officers when creating a coalition is the strained integration between conventional forces (CF) and SOF. Barriers to communication materialized as conflicts over command and control (C2) rooted in lack of CF understanding of SOF capabilities. Another problem is when it appears that SOF developed relationships with PNs before CF had an opportunity to do so. This is due to pre-existing relationships with PN SOF; many PNs have experienced the same challenges working with their own CF. Since the space between SOF leaders and national leadership may be compressed, decisions for SOF can be made quicker, and that speed creates a perception that SOF were building their own coalition. These challenges in building a coalition can be addressed by educating CF in the capacities of SOF and how they are synchronized as a part of GCC’s efforts. A living network, proactive rather than reactive, has proven the importance of developing the GSN. Access into the SOCOM building is granted for LNOs and is more manageable for PNs than engagements with CENTCOM, as it belongs to a different GCC. A major drawback is that PN presence at SOCCENT is not currently possible, as the building is a Sensitive Compartmented Information Facility (SCIF)—TSOCs are not built or equipped to host coalition planning efforts. It is likely that the U.S. facilities will continue to have a rating of “No Foreign” for the foreseeable future. Since SOCOM and CENTCOM belong to two different structures, with overlapping operational areas, participants have discovered challenges in the LNO structure within the two commands. Since many SOF LNOs are junior in rank to their respective countries’ Senior National Representatives (SNR), all communication and reach-back must be coordinated to avoid confusion that can arise from reports written and submitted by two different people. SOF lines of communication are often short, and representatives will in many cases report directly to strategic military and political leadership in PN countries. It is therefore important to know and clarify how SOF fits into the CENTCOM SNR network and to clarify national caveats, political sensitivity, and limitations. CENTCOM was responsible for building a coalition during OIR; SOF forces on the other hand were already engaged in Iraq, causing uncertainty among planners about who was building the coalition. SNRs were at several occasions approached by CENTCOM without including SOF in the planning. CENTCOM needs to understand that SNRs are sometimes not connected to SOF, due to national defense structures. During OIR development, most nations needed a whole-of-government approach to the new line of operations, more than a CF-versus-SOF approach as the C2 structure represented in the initial phase. The lack of protocol and doctrine on how to establish a coalition has been immense. As stated by Commander NORSOCOM, rear Admiral Holte ”Operational requirements often out-pace established doctrine, relationships, and agreements. This can result in operations that require the establishment of a coalition that may not be properly resourced or planned—especially at the strategic level.” For future operations, integrated planners on both a permanent and case-by-case basis should be accommodated by SOCOM in order to handle the workload that creating a “coalition of the willing” requires. Having temporary planners present will lend long-term, big-picture values to the Joint Planning Groups (JPGs), as LNOs have to deal with several additional duties, both as LNOs and as exchange officers. With PN SOF representatives in theater, the GSN began working on a new line of approach. 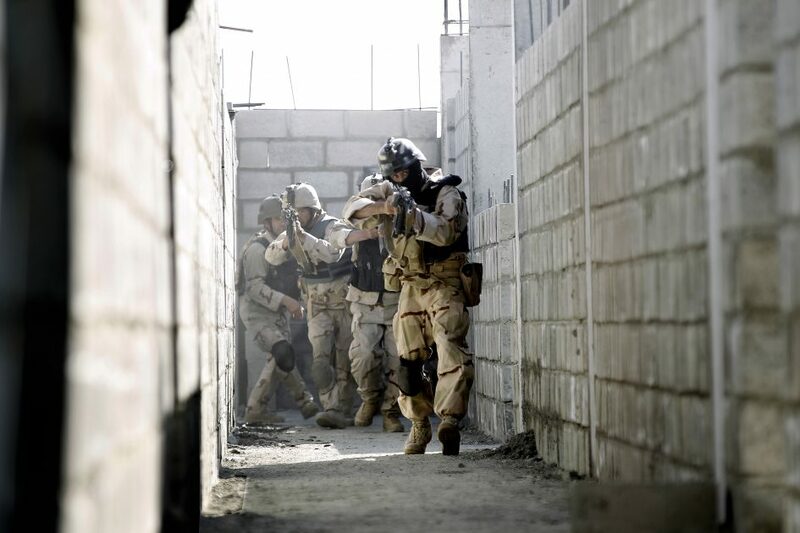 Forces assigned to Special Operations Joint Task Force-Iraq (SOJTF-I), significantly provided new and timely information to national headquarters and J3-I. This dramatically reduced the number of requests for information (RFI) previously fielded by SOCCENT teams. Additionally, partner LNO workload at SOCOM decreased significantly, as the partner HQ questions could be answered by those partners deployed on the ground. The PN deployment of planners and staff officers from national SOCOM structures forward provided new (PN influenced) situational awareness with key figures for the JPG VTC meetings at SOCOM. These opportunities adjusted PN expectations and provided more precise information on which capabilities were needed in OIR. The broadening of the GSN accelerated this process and resulted in greater efficiency and budget reductions. In an early stage of OIR, best practices resulted in SOJTF-I being granted permission to write reports for MESF release, and this information sharing ended the initial challenge of many reports being over-classified. While working in a coalition, many nations are accustomed to stamping every report with the SECRET/NOFORN classification, and breaking this habit will take time. However, the change has already enhanced information sharing, and reports from several countries have been provided to the OIR JPG. The main communication system in this effort was still the BICES system, reinforced by BICES professionals solving initial technical challenges. It is recommended for future operations that there be PN presences on SOF staff forward, with national and NATO communication systems, to improve planning prior to the deployment of the main body of any coalition partners. In the aftermath of the deployment of both CF and SOF to OIR, SOCOM and PNs have achieved well-coordinated and combat-proven integrated campaigning with partners. Skeptics, like Foreign Policy reporter Paul McLeary, have seen the rise of the GSN as controversial, even though it provides a common basis for SOF in a new environment. The GSN has proven its value in support of CF, preparing the battlefield and providing common knowledge through PN deployments and staff officers serving in joint staffs. The cultural differences between PNs and the U.S. in the GSN become more visible once members are deployed, rather than operating in an everyday situation at SOCOM. The largest difference, however, appears between the IA intelligence community and SOF. SOF operations require high-resolution intelligence, hence the importance of trust between the communities. Whereas SOF are deployed to conduct operations on the ground, intel analysts are provided safe and secure environments, focusing on doctrinal work and collection. Every SOF operator is willing to go above and beyond the call of duty to solve a mission. An intelligence analyst however, needs to prioritize among requirements and customers and will in many cases resist revealing information without exchange and prior concurrence from higher headquarters. A continuation of cooperation between IA operators and SOF will leverage operational experience of new technology and collection assets. It is needed and recommended that deployed forces view their role both within the GSN, and perhaps more importantly, the larger CF and IA environment. SOF and CF members are a part of the larger puzzle, the complex and evolving concept of war, which affects every soldier and nation participating in a conflict. Burden sharing and serving one’s nation for a common interest creates a network of trust larger than any single nation is capable of building. OIR has demonstrated that small nations’ cooperation with the U.S. can be timely, efficient, and cost-effective. The GSN can enable quick reaction time and rely on the whole network for support in a crisis response situation. This can include a variety of options, such as strategic lift assets, intelligence sharing, operational support, and strategic surveillance capabilities. Several PNs have experienced new challenges during OIR, and it is important for SOF commanders to expand their audience and to continue to educate military and political leaders on how to best deploy and employ SOF power in a dynamic environment. Political decision makers need to understand the importance of the GSN and how to efficiently use SOF. The continued development of SOF partners within SOCOM is depicted below. A steadfast growth in the coming years is likely to establish a PN presence with more than seventy countries, though this could become somewhat unwieldy if not tailored for more efficient partnering. The expansion of PN representation at SOCOM depicted in Figure 2 is likely to result in two significant challenges. The first will be a perception of freeriding by smaller nations on the backs of large, mature, SOF-capable states. The purpose of sending representatives to SOCOM is not to improve current operations but to get out in front of current operations in order to be better positioned, networked, resourced, and postured to defeat adversaries before they have the initiative, or to confront them from a position of superiority. Since SOCOM does not conduct tactical operations, small nations should consider if an LNO position within a TSOC is of higher value, due to proximity and operational experience needed for the individual country. Limitations on access from the U.S. side may restrict this possibility. U.S. military decision makers must not provide mixed signals to PNs when suggesting coalitions. Information sharing with PNs must be a primary consideration to avoid bottlenecks created by inability to share sensitive information critical to mission success. Second, by expanding PN presence, the GSN might lose some of its value. If too many nations are included, what are the benefits to the individual nation? “The perception of being valued and treated as special is important for participation in any network”These challenges should be considered by PNs in the GSN when enthusiastically contributing to the Global SOF Enterprise. …commissioned into the Norwegian Army in August 1995 where he joined a legendary Norwegian infantry unit, the Telemark Battalion. In 1999, he completed selection and basic training at the Norwegian Army Special Operations Commando (NORASOC). 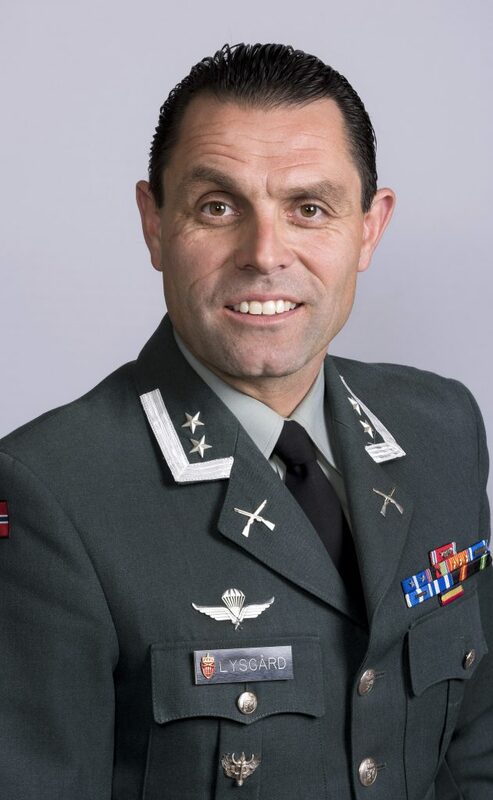 LTC Lysgård’s notable assignments include: Platoon Leader in the Norwegian Army Special Operations Command (NORASOC); Special Operations Advisor to the Norwegian Ministry of Defense; Squadron Commander in NORASOC; Aide-de Camp to the Norwegian Chief of Defense: and the first Norwegian exchange Liaison Officer to USSOCOM. Currently, LTC Lysgård serves in the Norwegian Defense University College on a joint assignment as the Chair for the study of Special Operations. LTC Lysgård completed several deployments to Afghanistan in support of both Operation Enduring Freedom (OEF) and the International Security Assistance Force. Additionally, he participated in multiple operations in Kosovo and the former Yugoslavia. Lieutenant Colonel Lysgård has a Bachelor’s of Military Studies from the Norwegian Military Academy with a minor in Crisis Management, Communication, and Joint Cooperation. He also earned a Masters of Military Science from the US Marine Corps University, where he graduated as a distinguished graduate. His notable awards and decorations include the Medal of St. Olav (with oak leaf cluster) and the Navy Presidential Unit Citation for his contributions to Task Force K-bar during OEF. In a private capacity, LTC Lysgård is the Co-founder and Chairman of the Board for the Gunnar Sønsteby Foundation. The Foundation provides resources for persons supporting peace, democracy, and the strengthening of the Norwegian Armed Forces. Gunnar, Myklebust, Tungtvanns-Sabotøren, Ascheoug 2011, 50. Douglas, Waller, Disciples, Simon & Schuster, 2015, 93. Waller, Disciples, Simon & Schuster, 96. Peter, Forbath and William, Colby, Honorable Men: My Life in the CIA, Simon & Schuster, 1978, 50. Eirik Kristoffersen, “Small States-Smart Solutions: Investing in a National Joint Special Operations Command” (master´s thesis, United States Army War College, 2015), 3. Kristoffersen, “Small States-Smart Solutions,” 7. Gray, Colin, “Handfuls of Heroes on Desperate Ventures: When do Special Operations Succeed?” United States Army War College, 1999, 7. Kristoffersen, “Small States-Smart Solutions”, 9. McRaven, William H. Posture Statement Before the 113th Congress House Armed Services Committee. March 6,2013. Kristoffersen, “Small States-Smart Solutions ”, 8. Carling, Jonas, Kihl, Tom-Erik, “The Global Special Operations Forces network from a partner-nation perspective”, (master thesis, Naval Post Graduate School), 2014, 7. Scott Morrison, “Redefining the Indirect Approach, Defining Special Operations Forces (SOF) Power, and the Global Networking of SOF,” Journal of Strategic Security 7, no. 2 (2013): 48‒54. Carling, Kihl, “The GSN”, 40. Carling, Kihl, “The GSN”, 52.